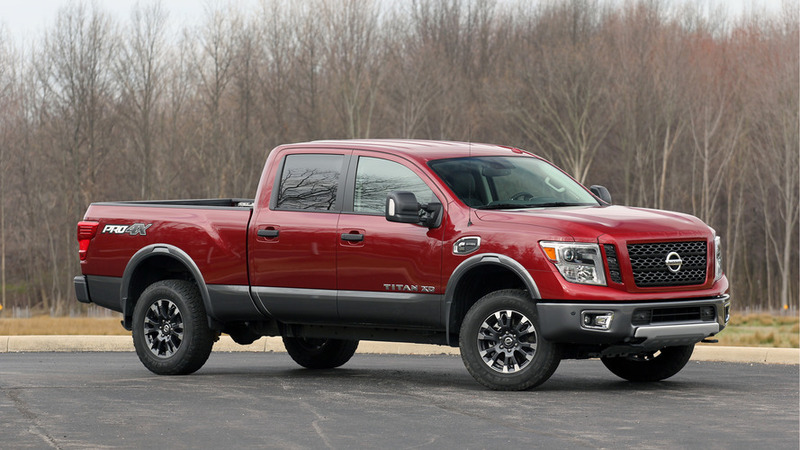 After innovating with a diesel engine, Nissan plays it extremely safe with its gas-powered Titan XD. Other than the race to build the world’s fastest performance car, there isn’t a more secretive, competitive, and cutthroat segment of the automotive market than the pursuit of the perfect pickup truck. You can’t afford to get it wrong with a fullsize pickup, especially if you’re not Chevrolet or Ford, which have essentially dominated the market since the category was created. That’s why it’s impressive that other manufacturers have deigned to set foot in the game and claw for market share, and even more so that some have succeeded. The spirit of competition resulted in the original light-duty pickup trucks from Toyota and Nissan. Generations later, the challenger brands’ products are stronger than ever, but still struggling to make a name for themselves. Toyota surprised with a Tundra that elevated the status quo, and Honda innovated with the original Ridgeline – soon to be followed up – but the greatest success story has arguably been Nissan, which established a strong foundation on the Titan name over a decade ago, and has just launched the second generation of the truck. Both models will be dubbed “XD,” despite major differences under the hood. We traveled to Nissan’s American backyard in Nashville to have a first look at the second member of the Titan XD family – not the diesel model we already know, but instead the one powered by a gasoline-fed V8. Both models will be dubbed “XD,” despite major differences under the hood, just as other pickup manufacturers don’t make similar distinctions with their own models. Nissan took an unconventional launch strategy by first introducing a heavy duty-style Titan XD powered by a diesel engine, and then parsing out the rest of the models. For some perspective, imagine if Ford relaunched the F-Series by starting with one particular F-250 body style. 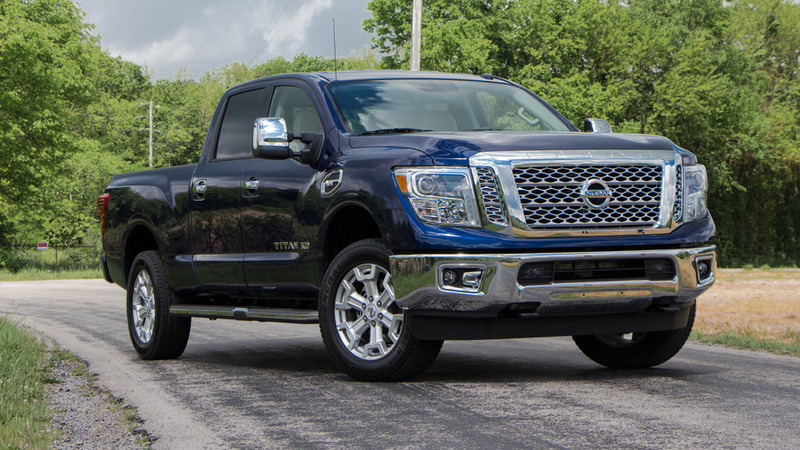 For its third act, Nissan will produce a “half-ton” Titan in multiple body styles, including a single-cab variant, as well as the popular King Cab, which are scheduled to arrive in 2017. It’s clear that Nissan has learned from its mistakes of offering essentially one type of Titan in its first generation, and the company is going to flesh out its lineup as quickly as possible this time around. The big news about the non-diesel Titan XD is that (a) it exists and (b) its 5.6-liter V8 is a more refined version of the unit Nissan has been producing for almost 12 years. Until a V6 arrives sometime in the future for the smaller Titan only, the volume model will likely be the Titan XD with this 390-horsepower, 401-pound-feet, naturally aspirated V8. A seven-speed automatic transmission subs in for the outgoing Titan’s five-speed automatic with the gas engine, while the Titan XD diesel retains a six-speed automatic. Beyond the powertrain difference, the gas-powered Titan XD is virtually the same, in so many ways, to the Titan XD diesel we recently drove – on paper, at least. The gas V8 only begins to stand out when driven back to back with the diesel model, which Nissan kept on hand for some contrast. In short, the difference in the two vehicles’ respective characteristics is night and day. Where the gas Titan XD can mightily attack an on-ramp, the diesel model takes its time getting up to speed. Both use recirculating ball steering racks, but the gas-powered model is calibrated as if an extension of the lineup that also features the Maxima. Changing direction in the diesel XD feels downright agricultural by contrast. In our brief road test on the highways and backroads in Nashville’s outer suburbs, we noticed fuel economy in the high teens. Think of the gas-powered model as the car-like one of the pair, while the Titan XD diesel acts and sounds the part of a gruff pickup truck. The Titan XD feels solid, and does without shaking, wallowing, or riding roughly over bumps, unlike some domestic trucks. Gruffness is all but absent in the Titan XD’s fairly soft ride quality and hushed cabin volume. 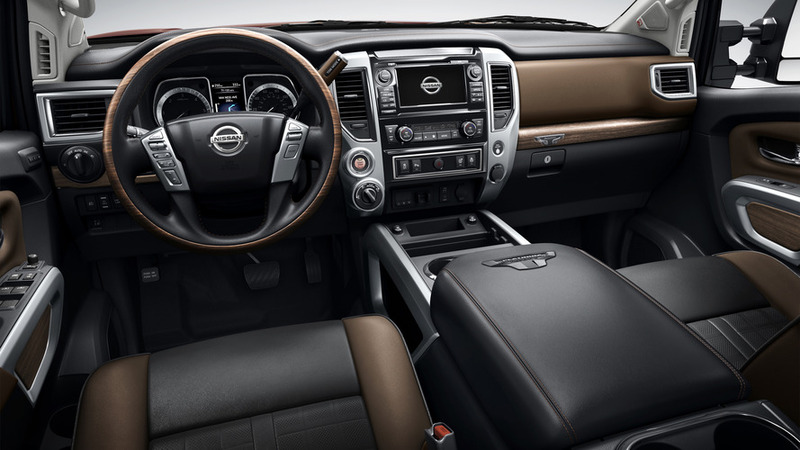 There’s no faulting Nissan for ensuring the interior is quiet, even on a work truck, and both Titan XD models are among the quietest in the segment, to our ears. The Titan XD feels solid, and does without shaking, wallowing, or riding roughly over bumps, unlike some domestic trucks. You could argue that, if the gas-powered Titan XD had been unveiled ahead of its diesel counterpart, perhaps we would have paid less attention to comparing the two models, and spent more time focusing on the fact that the pickup as a whole appears to be a serious contender. But look beyond the innovative diesel and the Titan XD starts to look like an also-ran. There aren’t gobs of unique selling points about the standard-bearer Titan XD, including in the passenger compartment, which is a fine but unexceptional place to be. There’s plenty of room for two up front – or three across, in base models – without feeling boatlike, with abundant storage space. The seats on the Titan XDs that we drove felt more plush than other pickups’, a critique we’ll revisit if and when we’re able to secure a lower-spec model. Interior styling is blocky and chunky, with soft-touch materials lining all the areas where you might rest your arms or elbows. Step up to the top Platinum Reserve trim and be treated to a two-tone interior with Bentley-style square leather patterning. To our eyes, the Titan XD looks to share many of its interior pieces with the Altima: a positive thing if you like the Altima, but a little out of place on a vehicle that costs two or three times as much. The greatest achievement for this generation of Titan is that it continues to exist as a respectable alternative to the establishment. 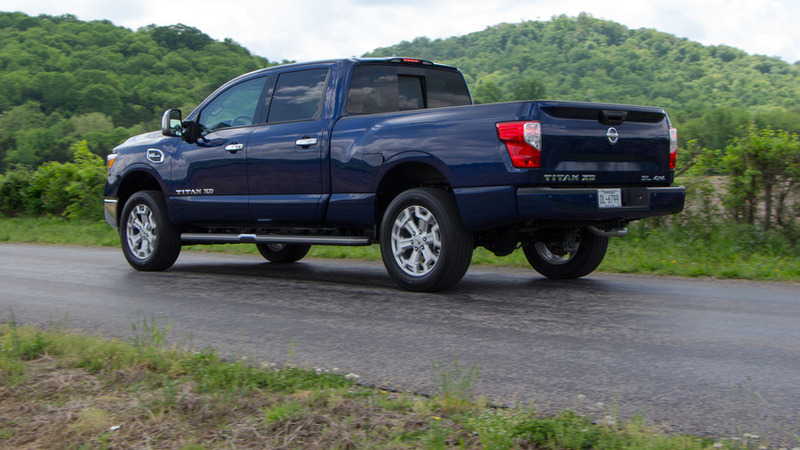 Feature for feature, the Titan XD falls short of the establishment – save, perhaps, for the less capable Toyota Tundra. With material quality and fit and finish nearly even across the pickup truck board, from F-150 to Silverado, attention turns to the Titan XD’s lack of feature content. 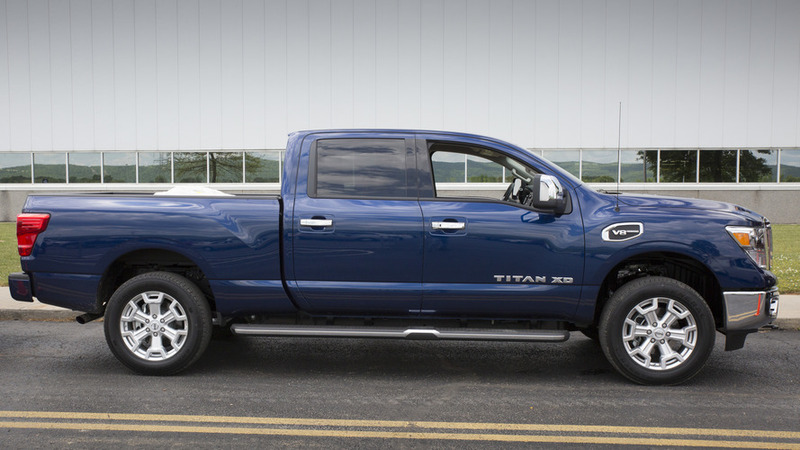 With the Titan XD crew cab, Nissan is pursuing a demographic that uses pickups as primary vehicles, but isn’t giving them the amenities that competitors do. Where are multiple USB ports, to compete with the GM gang, CarPlay to stay relevant, or an optional wifi hotspot? Massaging seats may not be a must-have in this segment (or any segment, really), but since Ford offers them on its Platinum trim, and Nissan is trying to match the F-Series in every other dimension, their absence is noticeable. The seven-inch infotainment system offers clear graphics and an easy-to-use touchscreen interface (the lowest-tier Titan XDs make do without a touchscreen), but we fear that it’s too small and delicate to endure day-to-day abuse by work truck users. At the end of a day of driving three different Titan XD trucks, we were back at our original argument: the greatest achievement for this generation of Titan is that it continues to exist as a respectable alternative to the establishment. Neither a revolutionary model nor a weak one, the gas-powered Titan XD is, in a sense, an interesting preview of what might come soon with the smaller Titan model. The heat in this race may only be simmering now, but we’re expecting a full boil.